If you see a message like this on your phone, delete it. Do not reply to it. If you reply STOP or HELP, you have confirmed to the sender that your number is a live one. If this text came from someone doing the text message version of spam (unsolicited commercial email of dubious value), you’ve just increased the value of your number to the “spammer.” That is, he can sell it to other marketers as an active phone number. If you reply YES, don’t be surprised if you find extra charges on your cell phone bill. Our research so far (4:10 p.m. on June 7, 2018) has not revealed this text message to be part of a SMiShing scheme — the text message equivalent of identity theft via phishing. 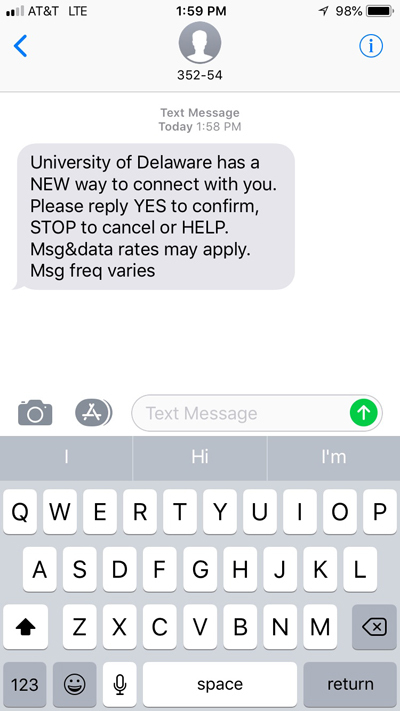 But without seeing any notification in any official UD email, on UDaily, or on any UD websites about a new UD text messaging program, you should be suspicious of this kind of message.